Surface 2,015 sq. 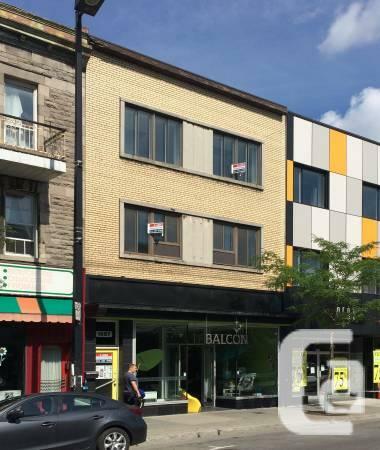 ft. - 2 floors, 8 home offices - on Le Plateau. - 2nd as well as 3rd floor of a structure on Ave. du Mont-Royal. - appr 2,015 sq. ft.
- 8 firms and also numerous areas to share (kitchen area, photocopier/mail room, celebration location). - 1 kitchen area, 2 restrooms. - Private entrance (door and stairways) on Ave. du Mont-Royal. - rental 1,800 $ excl commercial taxes as well as Hydro-Québec. - possibility of industrial taxes aid for Non-profits. The structure is found on 1587 Ave du Mont-Royal between Fabre and Marquette, at the heart of Le Plateau. Perfect area for Graphic Layout, Design, Consultancy, communications, Legal/Financial Firm, or a discussed working space. 8 workplaces with doors as well as Ethernet. Open as well as shared spaces for Reception, Boardroom, Duplicate Room, Kitchen, Eating Location, 2 bathrooms. Exclusive entry on Road degree (door as well as stairs on Ave. du Mont-Royal), Community vehicle parking offered in the back, along with BIXI bikes. Exceptional access to public transportation (lines 45, 97 and also Métro Mt.-Royal). Close to everything. Alarm system, Cooling, door opening system. Please call Arnold (cellular phone or e-mail) to arrange a check out.